Oy. Troy breaks his computer and therefore sounds like he’s calling in from a submarine. But the rest of show is a long discussion about Games Masters experimenting with RPG and miniature mechanics. 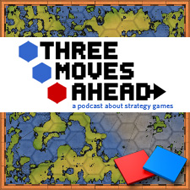 Julian and Rob discuss a fascinating game session before the team digresses onto iterative learning in game design and whether games do a good job of teaching through systems at all. Promised images will have to wait until I have a computer that can resize them properly. Stupid netbook. I think it would be awesome if the system/scenario Rob and Julian played was available as a commercial product. If that was a board game/rules set, I think it would be really interesting, and could change up how people felt about rule sets and RPGs. I also got some time in on the miniatures game (which was just *incredible*), and the problem I see with launching something like this as a commercial product is: Where’s the replay value? The game’s fun is in its puzzle: Once you’ve figured out how to “beat” the battle, what’s left to keep you coming back? I suppose you could take the scenario to new players, of course, but for a given set of players, there’s nothing left in the game once you figure out the game’s core mystery (that is: How to rout the British). Now, that said, I’d buy this game in a heartbeat (I’m already trying to figure out how I can use this iterative game mechanic in my next D&D session). I loved the game so much, and the experience was so special, that I would be willing to shell out $40 or $50 (or however much it would be) for a one- or two-time use game. But I can’t see too many other people doing the same without at least some promise of replay value. If there were multiple scenarios that used the same pieces. That way it could be played multiple times, and online communities could come up with new scenarios as well. It would be something cool for conventions and rare get togethers. After listening both to TMA and the GWJ podcast regarding the miniatures game at RabbitCon, I think you’ve missed the obvious comparison. It’s not an RPG/strategy blend but a rouge-like without the random map. What levels up is not the player’s character (like an RPG) but the player himself (like a rouge-like). While I agree that replayability would be a bit limited, that’s true for a lot of computer games these days (shooters and such more than RPGs and strategy games). I don’t think that’s the limiting factor here, it’s the AI’s ability to handle the unexpected in order to make the experience worthwhile. About that game, there are similar videogames, just have a look to all the “Grow” games, wich are like puzzles. The collective learning exercise miniature game made for one of your most interesting podcasts! It sounded like a really great experience. I was also delighted to hear The Defence of Duffer’s Drift mentioned and I can easily see where several of its lessons would’ve been applicable in your game. Talking about games that teach through their systems, PeaceMaker has stuck in my mind as the greatest learning experience I’ve had with a game. It doesn’t so much teach how to play itself beyond the usual but it really teaches its player about the peace process in the Middle East and about the challenges the Palestinian president and the Israeli prime minister face. It really opens your eyes and after playing it you’ll read news from the region with a new understanding. It doesn’t even take that long to have an effect, after one evening of play you’ll already be very fluent with the issues. And don’t forget to post those photos. =) Thanks!